in Chicago. The cable goes all around the cuff, which I made longer than the usual mittens. My Mom made our mittens with longer cuffs so they stay tucked into our coats and I always wondered why more mittens weren't made this way. The palm of the mitten is Stockinette Stitch. Although I would rate this for an intermediate knitter it's a quick knit. 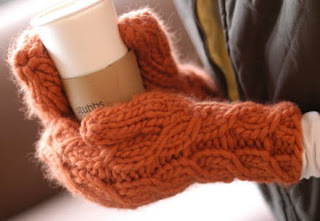 These mittens are amazing! I made them for my college age daughter. She swears they're the warmest mittens she's ever owned. The cold and wet winters in the Pacific NW are no match for these! I'm really struggling to follow the pattern as writ after finishing the cuff. I know it sounds ridiculous but a line by line pattern would be easier to follow, especially at points such as where you move from the 3 round repeat to the divide for thumb - am I knitting another row in pattern? Apologies if any of this difficultly is just coming from my inexperience with mittens, but I'm having a lot of issues, which is a shame because they look so lovely in the picture. Sorry to hear you're struggling Sarah! Email me so I can help you figure it out. Thanks!